Antje Duvekot (AN-tyuh DOO-va-kot) is a lovely match for the Rose Garden, which enters its 26th season. The German-born folk singer’s intimate, soul-searching music and vocals are the embodiment of the singer-songwriter spirit that the venue has always fostered. The Rose Garden has always featured and nurtured acts that are up-and-coming. Antje seems to have bridged that gap and become better known, but it wasn’t long ago that she was a newcomer to the region’s folk scene. 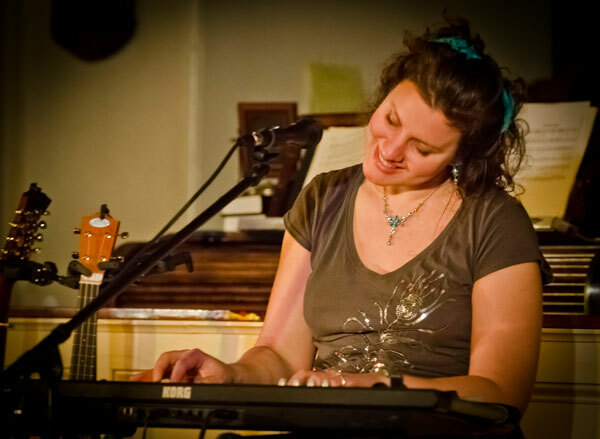 And Antje, who soon will release her fourth CD”Twenty Dollar Leap Year,” like the Rose Garden, is giving back. This past month she taught at The Song School in Lyons, Colorado, and then performed at the prestigious Rocky Mountain Folk Festival. She says that teaching budding songwriters is something she has wanted to do for some time. To further that cause, she also has taught at Harvard Square’s Club Passim and the Alaska Midnight Sun song camp. In my 40 years performing and writing about folk music, I have never seen a coffeehouse that met that test better than the Rose Garden — and that’s all about the volunteers. I always like to get there early and watch people come in. They’re already smiling, so happy with themselves for coming, so sure they’re in for a fun evening. If they’re in mid-conversation, they don’t stop when they enter the hall, feeling suddenly like they’re in someone’s else’s place. They keep right on chatting, as if they’re just wandering from the kitchen to the living room. They still feel like they’re home. I wonder if you know how rare that is. The crowd feels like the Rose Garden is their coffeehouse because the volunteers feel that way, too. There’s always happy, easy chatter coming from the kitchen and the set-up crew, and everyone in the crowd feels like they’re part of that fun. I can tell you it’s a big dividend for performers, too. The audience is already glad they came. And that’s all about the volunteers. Read more about what Scott had to say about the Rose Garden. The Antje Duvekot show will begin at 8 p.m. on Saturday, Sept. 20, 2014. Doors open at 7:30. For tickets and more information, visit the Rose Garden website.